...but what about Julian Assange's cat? The WikiLeaks founder, who was arrested Thursday, has been charged with conspiring to hack into a Pentagon computer network. Presumably, Assange's illegal interactions with former Army intelligence officer Chelsea Manning are the main interest of law enforcement. 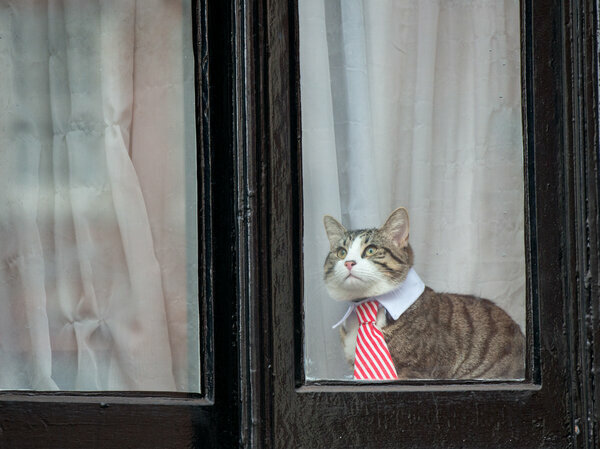 Re: ...but what about Julian Assange's cat? I emailed them about the cat earlier. I await their response. Julian Assange gave away his cat last November 2018. The cat's name was "Michi" which is Equadorian Spanish for cat. The cat also went by the name "Cat-stro" after the death of Fidel Castro, and "Embassy Cat." I figured that is why he got kicked out.......the litter box. I just hope some kind soul is caring for the cat but other countries don't elevate pets like we do so.....maybe someone will write about what happened. Edited 1 time(s). Last edit at 04/13/2019 08:04AM by samintx. Julian's cat is and is not still at the Embassy. HAHA! That's my laugh for the night.